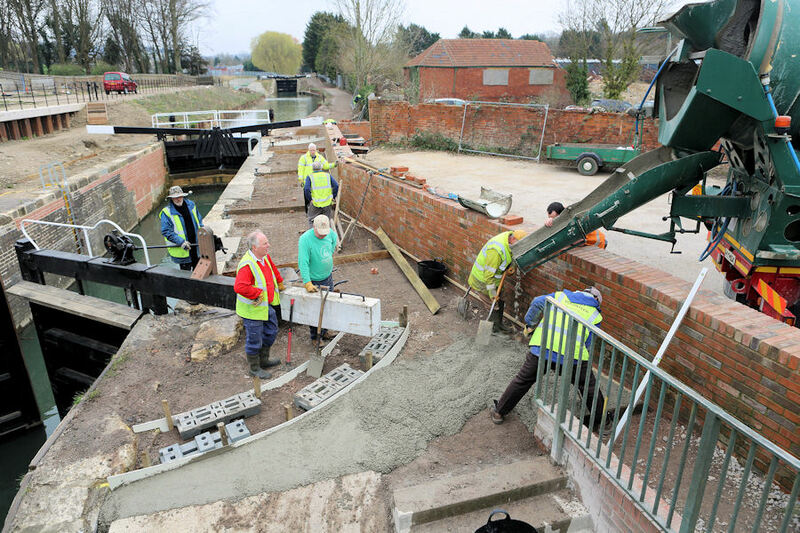 On Monday 10th March work commenced to install the concrete path adjacent to Dudbridge Lower Lock. The concrete causeway replaces the towpath scoured out by the winter floods. This project has been managed by Paul Weller of the Stroud District Council Canal Team. In this case the term ‘management’ refers to everything from site preparation, calculating quantities, identifying delivery points and times through to the co-ordination the installation staff. The term ‘installation staff’ in this case refers to a volunteer force of seventy volunteers whose ages range from 18 to 80 years! Site preparation was carried out by a team of Cotswold Canals Trust Western Depot volunteers. The team laid a network of reinforcing steel and shuttering alongside the lock and under Dudbridge Road Bridge. On Monday morning 6 cubic metres of C35 grade ready mixed concrete was delivered to site by locally based supplier Cullimore. 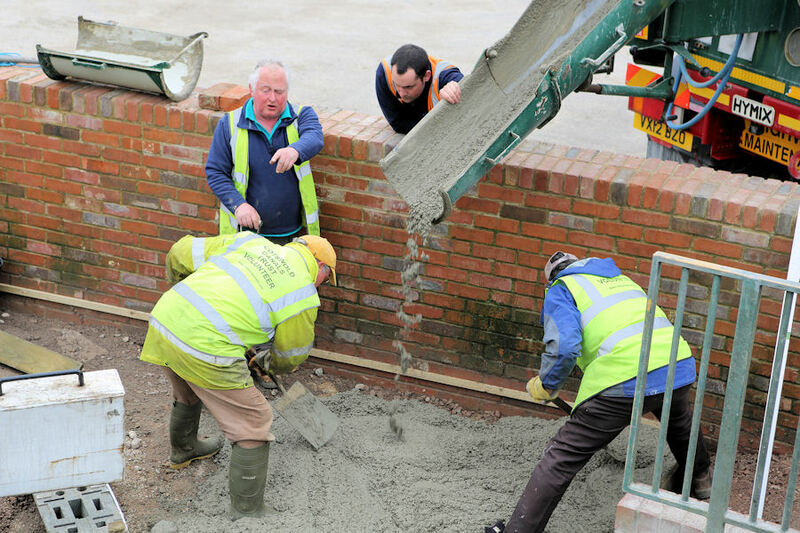 It is worth noting that 1 cubic metre of ready mixed concrete weighs 2.2 tonnes! The C35 Grade indicates the high specification and water resistance qualities of the mix. The Western Depot Volunteers set to barrowing, raking and tamping the mass of wet concrete. Stage two, will continue on Tuesday, Thursday and Friday with the final pour occurring on Monday next 17th March. Paul Weller praised the volunteers for the sheer effort and team work involved in installing over 50 tonnes of concrete. Paul explained… “The Cotswold Canals Trust Monday and Wednesday volunteers and the Tuesday and Thursday volunteers have been fantastic. "This is an enormous task for any group of volunteers. It is often said that ‘time spent on preparation and planning is rarely wasted’. "That has never been truer than on this job. We had to be ready for the arrival of the first load from Cullimores. The Tuesday and Thursday volunteers will carry on laying other concrete deliveries supplied by Kellaways of Stonehouse." Do you have time and energy to apply to some ‘exercise for a purpose’ on the canal restoration? Click here to find out more about the Cotswold Canals Trust Volunteers. Alternatively, give Paul a call on 07896 426 317 or click here to drop him and email.